Home to some of Bangkok’s most impressive attractions, including the stunning Grand Palace and Wat Pho, Rattanakosin is Bangkok’s historic district. The historical centre of the Rattanakosin Kingdom — Siam’s 18th and 19th century empire — Rattanakosin is an artificial island separated from the rest of Bangkok by canals on the east and the Chao Phraya River to the west. Built by King Rama I in 1782 and developed significantly since, the Grand Palace served as the official home of the King of Siam until 1925. 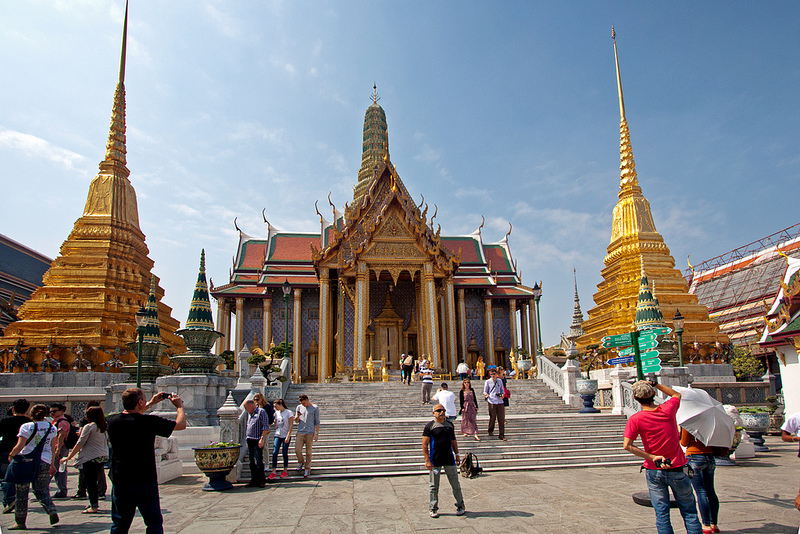 Today, the Grand Palace is one of Bangkok’s most popular tourist attractions for both Thais and foreign visitors. Entry is 500 baht, which also includes access to Dusit Palace. Inside the Grand Palace’s walls you’ll find a selection of temples, including Wat Phra Kaew — one of Thailand’s most important and sacred Buddhist temples. Popularly known as the Temple of the Reclining Buddha, Wat Pho is a short distance from the Grand Palace. The temple houses one of the world’s largest Buddha images, measuring over 160 feet in length. 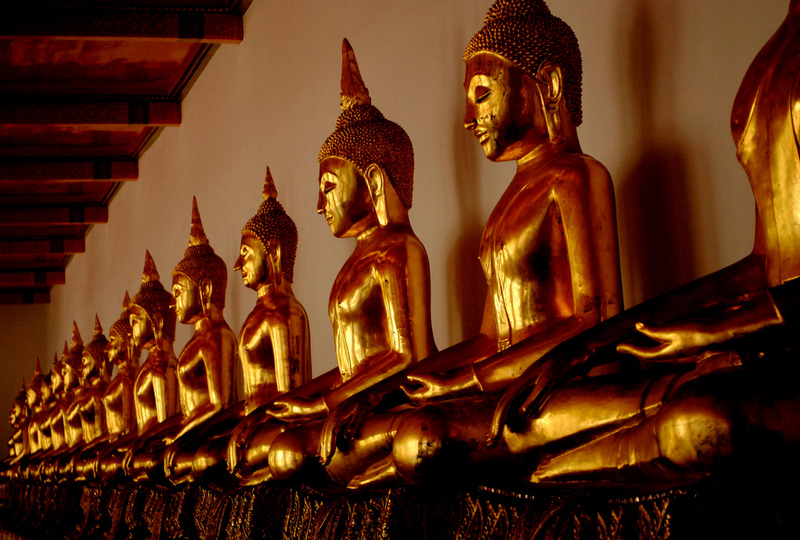 Wat Pho is often referred to as Thailand’s first university because of its massage school. The school, which is still open today, provides training in Thai massage. If you’d prefer to relax, it also offers inexpensive Thai massage starting from 420 baht per hour. Located in front of the Grand Palace, Sanam Luang is a large public green space that’s been used as a location for ceremonies and events for centuries. Today, it’s a nice place to relax during the day in between visiting Rattanakosin’s temples. Note that scammers often operate near Sanam Luang, offering to help tourists feed the birds and charging a massively inflated rate (often 300 baht or more) afterwards. Politely refuse if anyone approaches you offering bird feed or directions to any of the nearby temples. Saranrom Park is a charming small park located a short distance from the Grand Palace. The park was originally the grounds of a palace built by King Rama IV, and much of his design has been retained. A nice place to escape the heat in between visiting nearby temples. Tha Chang Pier — the Chao Phraya Express Boat pier nearest the Grand Palace — is home to an amulet market that’s open from 7 am until 5 pm. The area around the pier also contains an excellent fresh food market, making it a good place to stop for lunch. Wat Saket, commonly known as the Golden Mount, is a hilltop Buddhist temple built during the Ayutthaya era. The temple offers fantastic panoramic views of Bangkok, making it one of the most popular in the city with Thais and tourists alike. Less crowded than the other temples in the area, Wat Suthat is a large Buddhist temple that’s within walking distance of the Grand Palace. The Giant Swing – a gigantic swing designed for use in ceremonies but since partially disassembled – is located opposite the temple grounds. A short walk from the Grand Palace, Wat Ratchabophit is an impressive Buddhist temple that houses the Thai Royal Cemetery. Numerous monuments and memorials to relatives of King Chulalongkorn are located within the temple grounds. Southeast Asia’s largest museum, Bangkok National Museum houses a range of exhibits with a focus on Thai history, culture and art. Many of the museum’s exhibits also focus on the arts and culture of other Southeast and East Asian civilisations. King Prajadhipok Museum is a museum dedicated to the reign of Rama VII — Thailand’s last absolute monarch before the country’s transition to democracy. The museum houses a range of exhibits covering Thai history from the late 19th century until the beginning of World War II. Rajadamnern Stadium is one of the best places in Bangkok to view live Muay Thai. Fights are held on Monday, Wednesday, Thursday and Sunday from 6:30 pm. Ringside seats are priced at 2,000 baht, while regular seats in the stands are 1,000 baht per person. The Deck by the River, better known as simply “The Deck”, is a riverside restaurant inside the Arun Residence. The restaurant offers fantastic views of Wat Arun. Call ahead of time to book a table, especially if you’re visiting Bangkok between December and February. Located inside the stylish Sala Rattanakosin Hotel, Sala Rattanakosin Eatery and Bar offers a menu of Thai and international dishes along with a great view of Wat Arun. Ideal for romantic meals and special occasions. Better known as Pad Thai Phatupee, Thip Samai Pad Thai has been open since 1966 and is arguably Bangkok’s most famous Pad Thai restaurant. Unlike other restaurants, which use a gas burner to cook their Pad Thai, Thip Samai’s chefs prepare the classic dish over charcoal. Krua Khun Kung offers a far more local riverside dining experience than Rattanakosin’s other riverside restaurants. Located inside the Navy Club Building, this seafood restaurant serves a range of classic Thai dishes alongside a good view of the Chao Phraya River. Located opposite the Grand Palace, Krisa Coffee Shop is a conveniently located café that’s a great place to stop for lunch in between visiting Rattanakosin’s temples. The menu covers all of the classic Thai dishes at reasonable prices. Old Town Café Bangkok serves excellent sandwiches, croissants and coffee a short distance from the Grand Palace. One of the best cafés in Rattanakosin for a coffee and lunch break in between visiting the temples and museums. Located inside Arom D Hostel, Arom D Café and Bistro serves strong coffee and tasty Thai and international food just a few minutes from the Grand Palace and Wat Pho. A great place to stop for lunch or just for a morning coffee. Sala Rattanakosin is a luxurious 4½ star hotel offering fantastic views of Wat Arun. Thanks to its quiet and peaceful location next to the Chao Phraya River and close to Rattananokin’s best temples and cultural attractions, Sala Rattanakosin offers both relaxation and convenience. Conveniently located on Phra Athit Road, Riva Surya Bangkok Hotel offers spacious, modern and luxurious rooms with a location just steps away from some of the city’s best restaurants, cafés and bars. 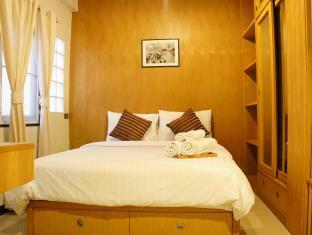 Arun Residence is a comfortable four-star hotel located beside the Chao Phraya River. Best known for The Deck — its charming riverside restaurant with great views of Wat Arun — Arun Residence is a good choice for travellers seeking a convenient yet relaxing location. Sourire at Rattanakosin Island Hotel offers a variety of cosy and comfortable rooms decorated with classic furniture. Thanks to its location on Ratchadamnoen Avenue, it’s a short walk from Bangkok’s most popular temples and the nearby nightlife on Khao San Road. This conveniently located three-star hotel offers excellent views of the Democracy Monument on Ratchadamnoen Avenue. Rooms are cosy but ideal for travellers seeking a combination of location, comfort and affordability. 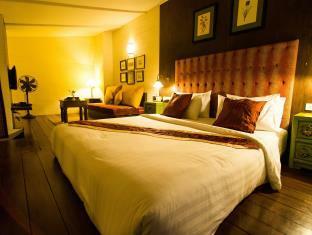 As its name suggests, The Warehouse Bangkok offers industrial-styled rooms in a fantastic location near the Grand Palace. 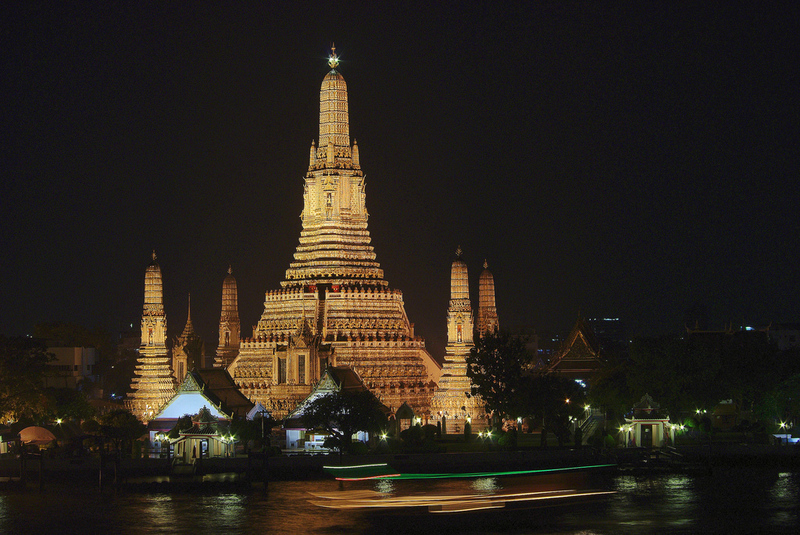 Sights such as Wat Pho and Sanam Luang are within easy walking distance, as is the nearest Chao Phraya Express Boat pier. Feung Nakorn Balcony is a conveniently located 3½ star hotel. Rooms range from dorm beds to suites ideal for families and large groups. Despite being located close to Sanam Luang and the Grand Palace, Feung Nakorn Balcony is a quiet and relaxing place to stay. Villa Phra Sumen is a modern three-star hotel overlooking one of Rattanakosin’s numerous khlongs. Its spacious, well decorated rooms are ideal for relaxing after a day exploring Wat Pho, the Grand Palace and other nearby attractions. Golden Mountain Hostel offers clean, simple and comfortable dorms (complete with pod-style beds) and private rooms. Located on Boripat Road, it’s a 10-minute walk to Sanam Luang and the Grand Palace, making this a great low-cost accommodation choice for sightseeing. The Region Hostel is a clean, comfortable and simple hostel located within walking distance of Wat Saket. Although it bills itself as a hostel, only private rooms, available with double and twin beds, are offered. Paragon One Residence is a clean, simple hotel located a short walk away from Khao San Road and the Democracy Monument on Ratchadamnoen. Rooms are very basic (windows are listed as an extra) but comfortable enough for travellers seeking a cheap place to sleep. Located less than five minutes away from Sanam Luang, Au Bon Hostel offers simple, clean rooms in a convenient location. Rooms are spacious and comfortable, but don’t expect much in the way of luxuries. Located close to the Democracy Monument and Khao San Road, Ratchadamnoen Residence is a surprising find. This no-frills hotel offers comfortable, clean rooms decorated with a stylish collection of mid-century modern furniture. Located close to Wat Saket, Niras Bankoc Cultural Hostel is a convenient choice if you plan on travelling around the city by khlong boat. 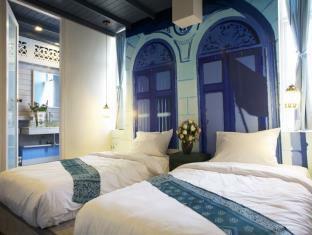 Rooms are clean and simple, with attractions like the Grand Palace and nightlife in Khao San Road a short walk away. At Smile House offers a range of stylishly decorated rooms — the superior rooms all feature brushed concrete walls and modern furniture — with a convenient location a few minutes from Sanam Luang and Khao San Road. Baanboran Bangkok is a simple two-star hotel decorated in a classic Thai style. Rooms come in twin and double varieties, some of which only provide a shared bathroom. Five minutes to Sanam Luang on foot. Located less than a minute’s walk from Wat Pho, Arom D Hostel has one of the best locations in Rattanakosin. Dorm beds start from 500 baht per night, with private twin and double rooms also available. Rattanakosin’s nightlife is mostly found around Khao San Road — the iconic backpacker street located a short walk from Ratchadamnoen Avenue. 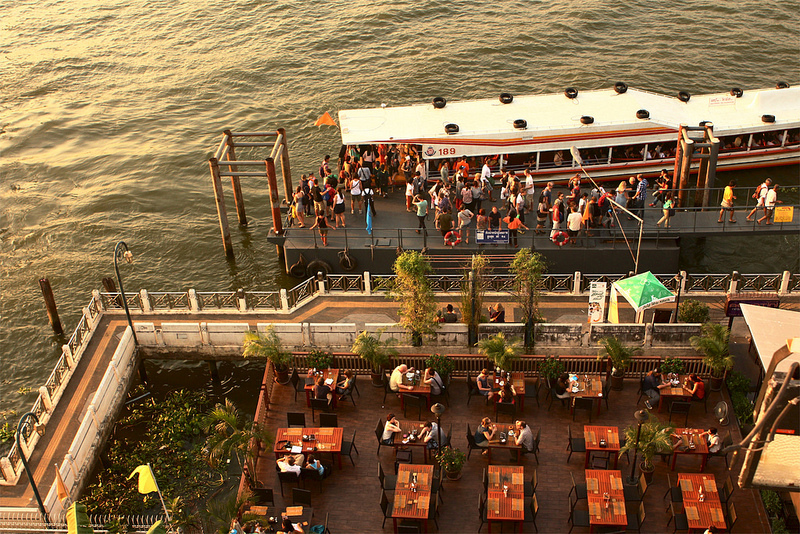 Drinks are cheap and bars packed with a mixed crowd of backpackers and Thai locals. Phra Athit Road, located to the north of Khao San Road, is home to a selection of Bangkok’s most popular jazz bars and hole-in-the-wall restaurants. Most of Rattanakosin’s attractions can be accessed from the Chao Phraya River. The Grand Palace and Wat Pho are a short walk from Tha Chang Pier (N9) while nightlife and the area’s best restaurants and cafés are easy to access from Phra Athit Pier (N13). The Chao Phraya Express Boat, which stops at all of Rattanakosin’s piers, connects with the BTS Skytrain at Sathorn Pier (CEN). 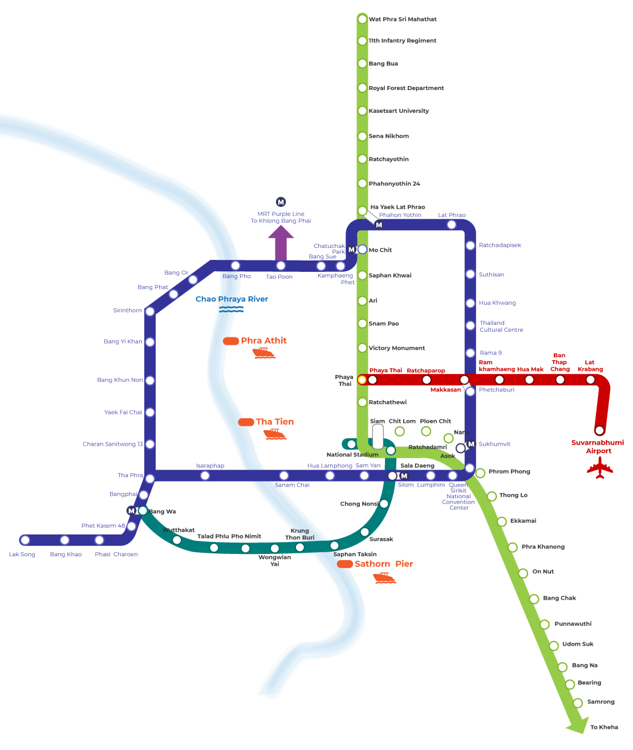 Although Rattanakosin doesn’t have any BTS or MRT stations of its own (an MRT station is scheduled for the future) it’s often quicker to reach the area by taking the BTS to Phaya Thai or National Stadium and catching a cab than by using the river boat. View Bangkok BTS and MRT Map full size.